I absolutely love this “hummus”. In fact, it’s quite addicting. But not to fret, it’s very good for you. It’s made with raw cashews, which even though they’re high in fat, it’s monounsaturated -the good kind of fat. It also contains curry powder, high in turmeric, which decreases inflammation. This is totally made for celery sticks. It’s a great snack to have mid-afternoon, when you just need to “crunch”. Drain and rinse your soaked cashews and sunflower seeds. Set aside. Place garlic cloves in food processor and chop until fine. Add raisins, spices, sea salt and lemon juice and process until smooth. Add the cashews, sunflower seeds, tahini and olive oil and blend until all ingredients are well combined. 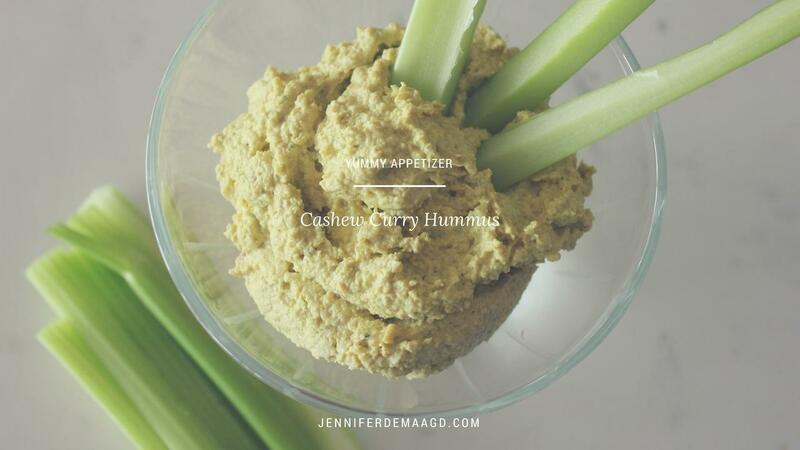 Add up to 3/4 cup filtered water if hummus seems too thick.